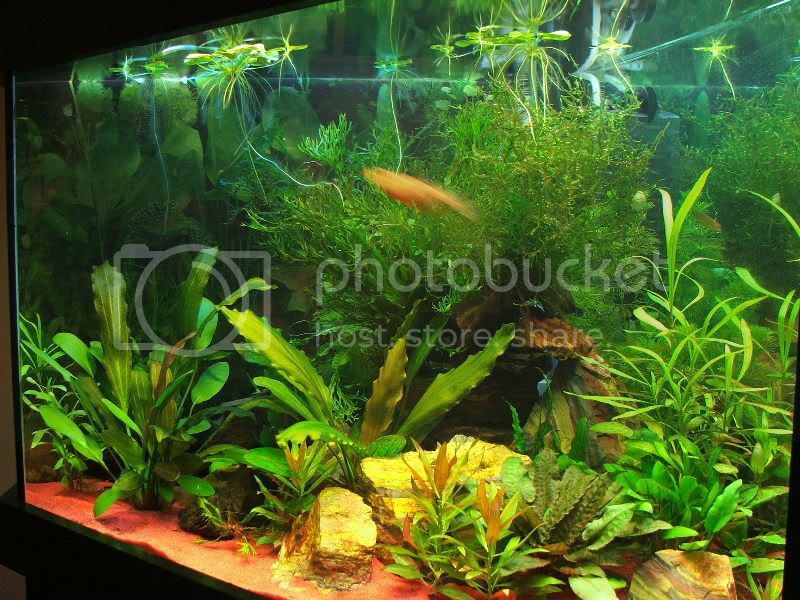 Hall of Fame "Puffertank of the Month"
The tank is 120g and home to a 11" Fahaka puffer. 13months old. Substrate is fine black gravel. Hood and cabinet - custom made. Ehiem Ecco Filter, media replaced with Carbon Ozonizer with airstone. Skimmerless, Sumpless, Refugium negative (lol). Yellow Star polyps, 2 Hawian feather dusters, 2 Colonies various mushrooms, Toadstool Coral, Leather Finger Coral. Winner September 2005 is Rocker. decor - bogwood and plants. Winner October 2005 is Rocker. This is a 75g 8 sided tank. 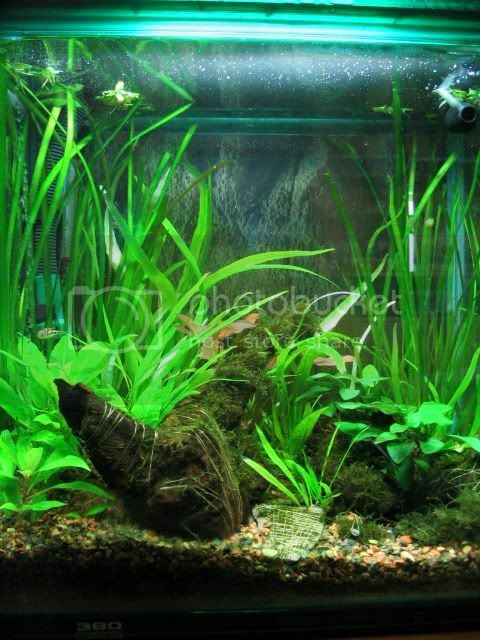 Home to 14 Dwarf puffers, 2 female irrubesco and 2 ottos. 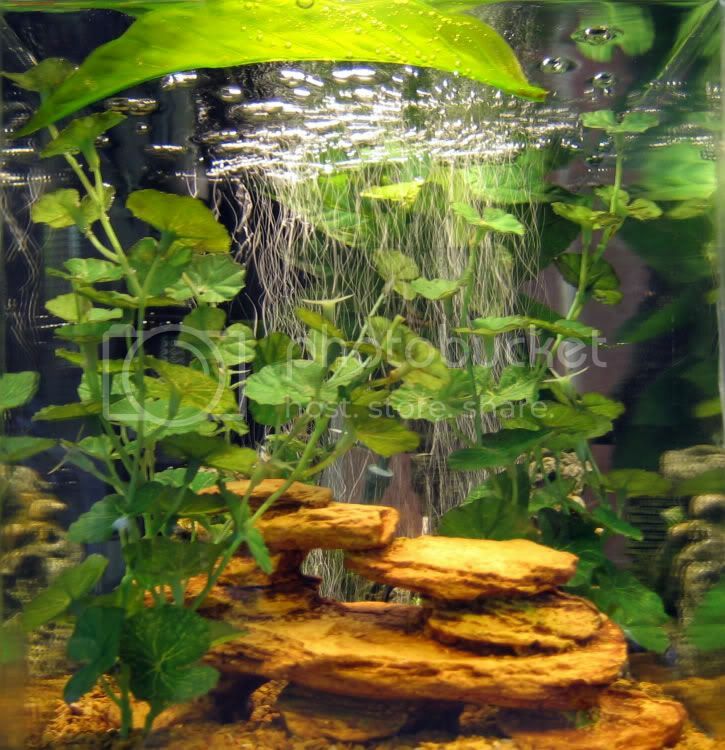 Filtration is a Fluval 404. There is also a 30" air curtain. Winner November 2005 is Woland. 90 gallon freshwater tank built into my living room wall. Rather heavily planted & decorated in order to make a semi-successful community tank containing 1 male and 2 Female Carinotetraodon irrubesco. 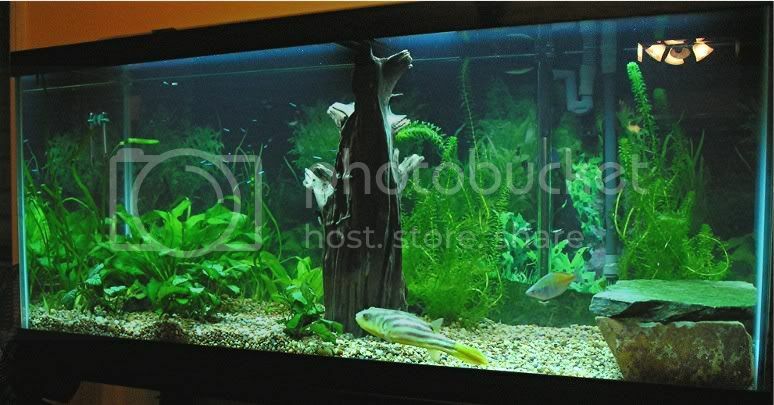 Other fishes are a Pleco, 10+ Ancistrus, 8 SAE, 2 Mikrogeophagus ramirezi, 2 Indian Dwarf cats and 40+ Neons. Plants take some punishment from the everlasting hunt for (imaginary) snails. 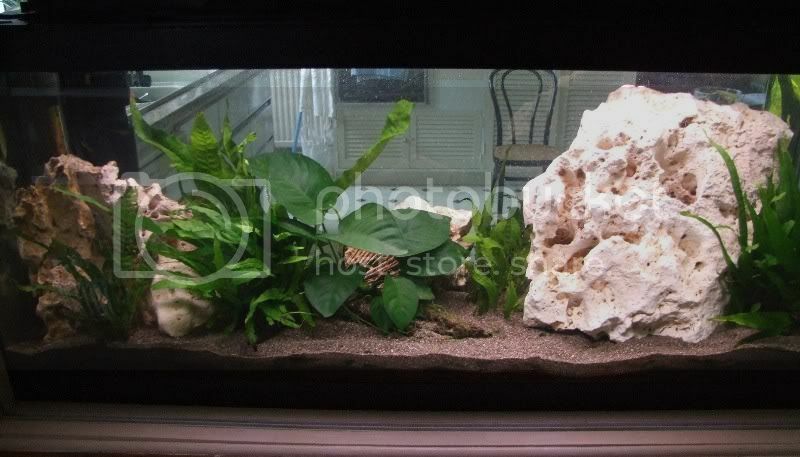 Small gravel as substrate. A select choice of roots are built together and attatched to a mahogany "frame" which is hidden under the gravel. Specs: T5 lights, JBL500 outboard filter, Fluval 4+ inboard filter, a small powerhead for current. Some call it a product of a mis-spent youth, I call it Rock n Roll ! The tank is a 75g planted. Tons of anacharis - much less than there used to be though. Winner for March 2006 is Puffernuke. Last edited by Rocker on Mon Aug 28, 2006 6:54 am, edited 1 time in total. Winner for June 2006 is puffer_archer. 3 C. irrubesco, a myriad of guppies and 4 ottos. Heavily decorated with bogwood and three artificial caves. Juwel internal filtration and fluval 304 external filtration. Winner for August 2006 is megs. - Decore: Fake plants, rocks, air stone. Winner for September 2006 is puffer-mike. Size of tank : 27 US Gal. 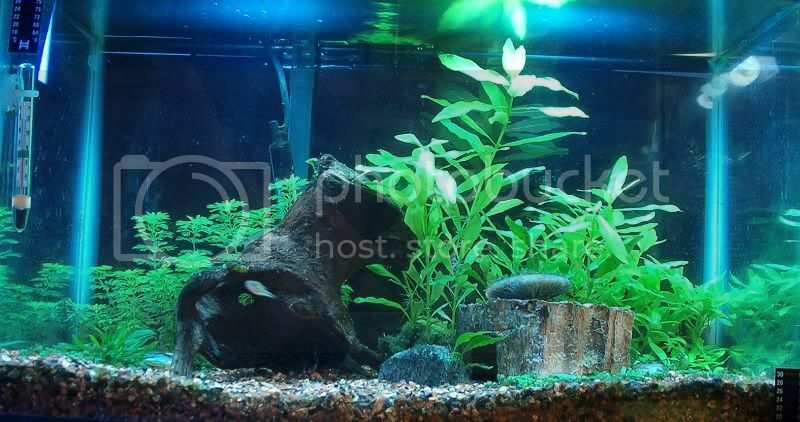 Large white rocks on black Aragonite sand with Java Ferns and an Anubias. Some of the Java Ferns are grown onto riverwood. 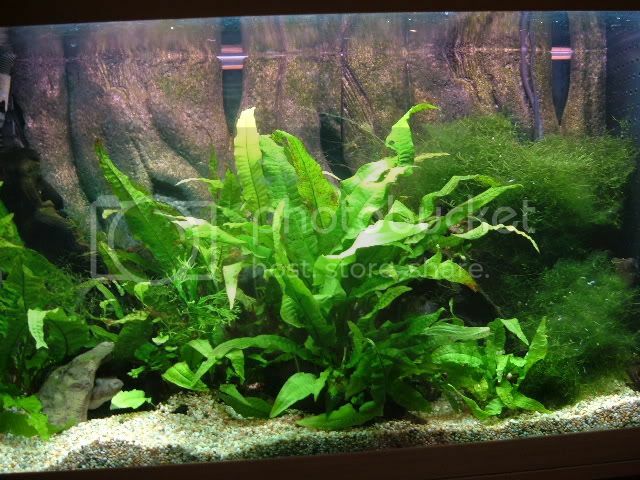 Filtered by a Fluval 3+ and has a CO2 system.